On a quiet road just outside London, in the blue half-light of dusk, a fatal car accident takes the life of thirteen-year-old Laura Jenkins, and her death changes the lives of two families forever. For Jack Philips, a married police officer with two small daughters, the consequences of that evening behind the wheel will force him to reassess everything he loves and to confront long-buried secrets from his past. For Lisa Jenkins, the loss of her daughter seems unbearable. As she struggles to find the courage to rebuild her life, her husband grows ever more reclusive, and Laura’s presence continues to haunt her. Eventually, Lisa’s and Jack’s paths cross in surprising and shocking ways as they both try to regain their footing. In this poignant and heartwarming debut novel, Elizabeth Diamond explores the ripple effects of a single moment of tragedy --- the journey from guilt to peace, from vengeance to forgiveness, from sorrow to hope --- and even, ultimately, to joy. 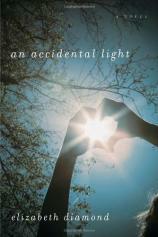 An Accidental Light is a tender and deeply affecting story that is not easily forgotten.